The IHOP Express®, located in the newly-renovated Terminal E, is the first IHOP restaurant to be located on the secure side of an airport. DALLAS, TX, 2017-Oct-27 — /Travel PR News/ — Hot, fluffy pancakes, late-night dining and all-day breakfast are the hallmarks of IHOP that customers traveling through Dallas Fort Worth International (DFW) Airport can now enjoy. The IHOP Express®, located in the newly-renovated Terminal E, is the first IHOP restaurant to be located on the secure side of an airport. Affording passengers both a sit down dining experience, including adult beverages, as well as the added convenience of a hot meal to go, the DFW location expects to serve 1,000-plus visitors a day, on average. For nearly 60 years, IHOP has been welcoming guests into restaurants to enjoy a delicious, affordable meal any time of day, every day. The brand continues to grow both domestically and internationally, currently serving guests at more than 1,750 franchised-locations throughout the world, including all 50 states. 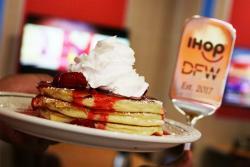 IHOP Express at DFW Airport is owned and operated by D&B Mitchell Group, based in Dallas, TX. D&B Mitchell Group was honored as Concessionaire of the Year this year by the North Central Texas Regional Certification Agency. This entry was posted in Airports, Food & Drinks, Travel, Travel Services, Travelers and tagged Dallas Fort Worth International Airport, IHOP Express®. Bookmark the permalink.